For all your printing needs on the Costa del Sol -- from Benalmadena and Fuengirola through to Marbella and Estepona. 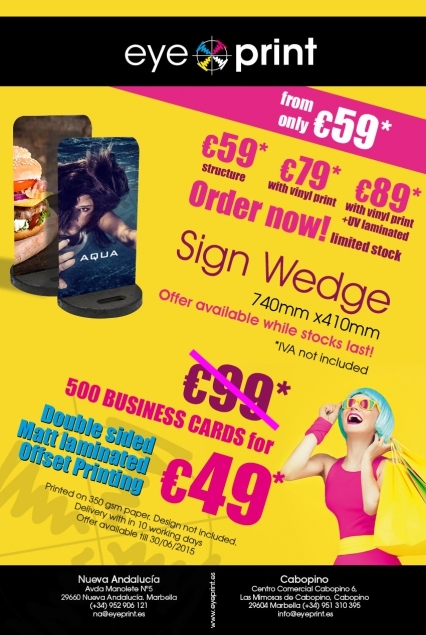 EyePrint's latest offer includes 500 business cards for just 49 EUR (original price: 99 EUR)! Double-sided, matt-laminated, offset prining. Delivery within 10 working days. Design not included. The offer is valid until June 30, 2015. EyePrint are professional printers on the Costa del Sol and have offices located in Cabopino (Marbella) and Nueva Andalucía (Puerto Banus). Eyeprint is the only one-stop-shop for all your printing needs, exhibition equipment, stationary, posters, office displays, signs, banners, and A-boards on the Costa del Sol. We actually print at EyePrint. We do not outsource printing, but have our own special equipment and are in-house printers. At EyePrint, we speak your language! We are the largest English printers on the Costa del Sol and offer digital and offset printing, professional graphic design services, and an unlimited range of display and exhibition materials, including pop-ups, Rolla Banners, and A-boards to suit all businesses and budgets. For all your printing needs, do not hesitate to contact us! Eyeprint - For all your printing needs on the Costa del Sol! Eyeprint: For All Your Printing Needs on the Costa del Sol!